This week there were several plants that were in contention for the plant of the week. Itea virginica Henry’s Garnet’, Nandina ‘Firepower’ and even the Double Knockout Rose all were worthy plants for the plant that was most outstanding this week. Itea and Nandina were for their beautiful fall color and Double Red Knockout Rose for the great floral display this late into the season. The plant that caught my eye the most this week was Hydrangea quercifolia ‘Pee Wee’. The Pee Wee Oakleaf Hydrangea showed outstanding fall color from a deep burgundy to wine-red. The fall color was superior to Sikes Dwarf Oakleaf Hydrangea and held its foliage much longer into the season. Pee Wee Hydrangea is a compact form of Oakleaf Hydrangea growing only 3’ tall by 4 feet wide. The leaves are slightly smaller and seem to be a bit thicker. Flowers are creamy white, slightly smaller than most Oakleaf Hydrangea flowers. Fall color is a deep burgundy to wine-red. The compact habit makes Pee Wee a more useable form of Oakleaf Hydrangea for the home landscape. Pee Wee Oakleaf Hydrangea is also more drought tolerant as compared to other Oakleaf Hydrangea. I think this may be contributed to the slightly smaller, thicker foliage Pee Wee has. This opens up planting Pee Wee to more full sun possibilities. Oakleaf Hydrangea typically is planted in morning sun or part shade locations. Pee Wee will be able to tolerate more sun in the landscape therefore making it more adaptable to more locations. 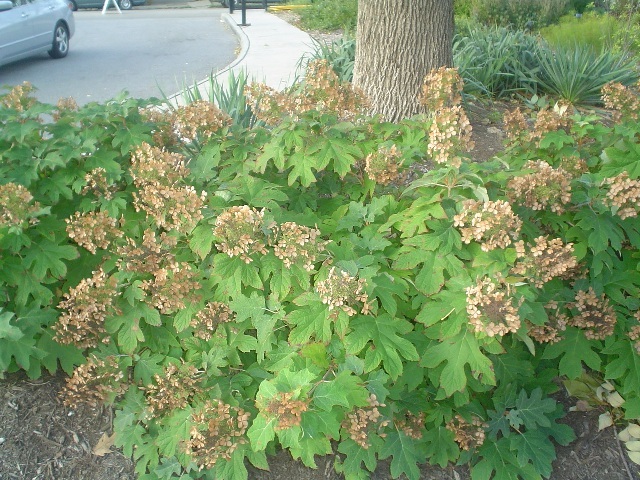 While Oakleafs require water when it is dry, planting in wet soil is a problem. Do not plant in soils that are soggy or wet. Another tip in successful planting of Oakleaf Hydrangea is to start with a healthy plant. Larger, well-branched specimens of Oakleaf Hydrangea will give you better results in successful establishment of the plants. Planted in groupings or as a specimen, Pee Wee Oakleaf Hydrangea will give you multiple seasons of interest. In front landscapes, patios, perennial borders or even small hedges Pee Wee Oakleaf Hydrangea is a fantastic plant for any landscape.